According to statistics, there’s a one in 135 chance to find our doppelganger roaming around in this world. And a Gram Panchayat candidate did it by finding Virat Kohli’s double and he used him to his fullest potential. Now, the internet has graduated from the Indian men’s team’s captain to their coach, Ravi Shastri. Nobody knows where he came from or who he actually is. The only thing the internet knew that he looked exactly like a disgruntled Ravi Shastri. That’s why they decided to crack some jokes at his expense. 2. 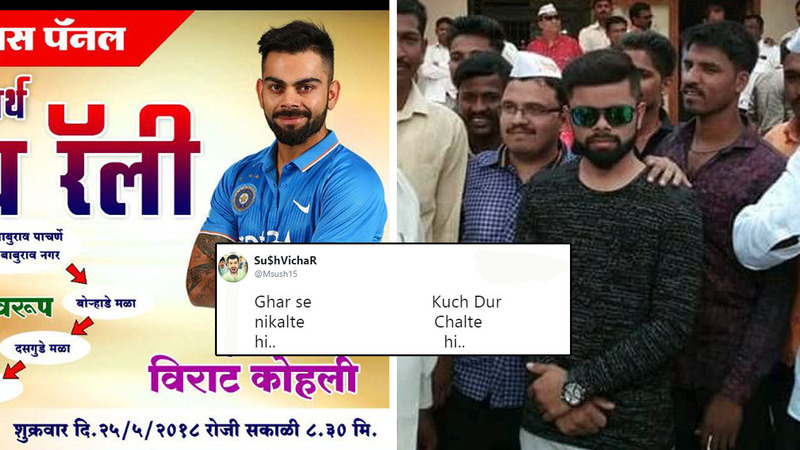 Why you do this, Virat? 4. Hey, go easy now. 6. Ye kya se kya ho gaya? 7. Ye bandhan toh, pyaar ka bandhan hai! 8. It’s Diwali season, man. 9. They’ve more important things to worry about. The tall stature of a man can only be judged by the fact how grounded he is. Here is Ravi Shastri Ji, travelling in Mumbai local train. Still you doubt his character. 11. Arre sir, aap ja kaha rahe ho? So, how closely do you think this man resemble Ravi Shastri? Or is it actually Ravi Shastri who decided to shave off his mustache and take a ride on a local train? So many questions!